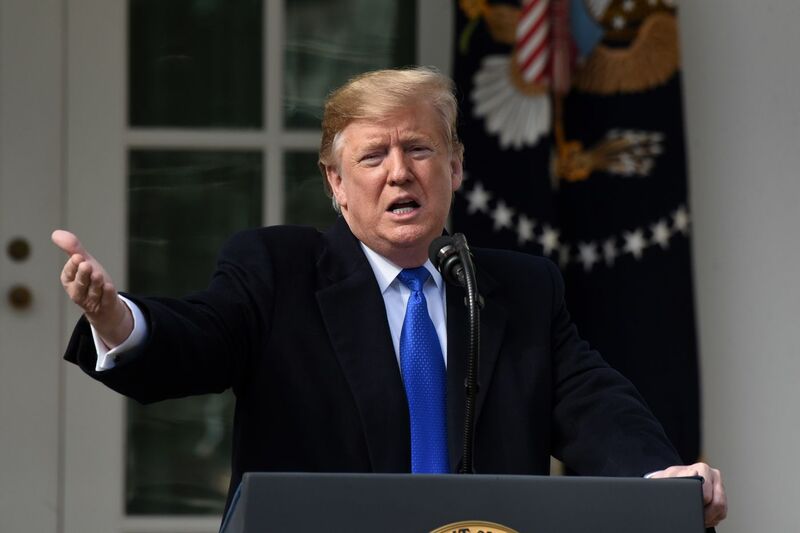 President Donald Trump said he signed an order declaring a national emergency at the southern border on Friday, in a rambling speech at the White House that touched on everything from trade negotiations with China to the state of the U.S. economy. Trump’s decision to declare an emergency at the border — where arrests are down dramatically compared to 10 to 15 years ago — is a controversial move designed to secure billions of dollars Congress didn’t authorize him to spend for a proposed wall. National emergency: What is it, and why did Trump declare one over the border? According to multiple reports, Trump plans to use his emergency declaration to unilaterally acquire more than $5.7 billion from other agencies — including the Department of Defense — and use it to begin construction of his proposed border wall. The idea has drawn criticism from both parties, including Republican Sen. Marco Rubio of Florida, who said in a statement Thursday that “no crisis justifies violating the Constitution." Trump alluded to the controversy over the declaration during his speech, noting he expected to be “sued” over the move. He also appeared to undermine his own case that there is an emergency at the southern border by declaring he “didn’t need to do this." “I could do the wall over a longer period of time," Trump admitted. “I didn’t need to do this. But I’d rather do it much faster." Trump made the declaration prior to signing a bipartisan spending bill that passed through both the House and Senate with overwhelming majorities on Thursday. That bill, which will fund several federal departments through Sept. 30 and prevent another partial government shutdown, only includes roughly $1.375 billion for about 55 miles of border fencing. After declaring a national emergency at the southern border, Trump and First Lady Melania Trump will travel to south Florida to spend the weekend at his Mar-a-Lago golf resort, according to the president’s public schedule. The president and the first lady are scheduled to depart from Joint Base Andrews on Air Force One at 4:20 p.m. They are expected to arrive at Mar-a-Lago around 7 p.m.
By signing the bill to avert another partial shutdown, Pres Trump plans to leave this afternoon for another weekend stay at his Mar-a-Lago resort in Palm Beach. Will be his his 20th visit spanning 85 days since taking office. Trump has officially signed the bipartisan spending bill into law, averting another partial government shutdown that would have impacted more than 800,000 federal workers and cut off funding for nine federal agencies. White House Press Secretary Sarah Sanders told reporters the president signed the legislation into law around 2 p.m. No reporters were present. Senate Majority Leader Mitch McConnell (R., Ky.), who had previously opposed a national emergency declaration, blamed Trump’s decision on Democrats unwilling to fully fund his proposed border wall. Speaker of the House Nancy Pelosi and Senate Minority Leader Chuck Schumer called Trump’s declaration of an emergency to seize funds to build a wall along the southern border “unlawful" in a joint statement following the president’s Rose Garden event. Did Trump undermine his own argument about an emergency? Trump appeared to undermine his own case there is an emergency at the southern border in an answer to NBC News White House correspondent Pete Alexander. “That answer will complicate his legal case,” Alexander wrote on Twitter. Trump denied that conservative pundits like Fox News Sean Hannity and syndicated talk show host Rush Limbaugh — who have pressed the president to declare an emergency at the border — influenced his decision making. “They don’t decide policy,” Trump told reporters. The White House has not released details about which specific programs it plans to divert funds from. Fox News host Sean Hannity, who has reportedly been advising the president on his border strategy, has been pushing Trump to declare an national emergency since interviewing the president from the border earlier this month, during the 35-day partial government shutdown. “This is the time. That is a necessity,” Hannity said on his Fox News show earlier this week. But the move hasn’t pleased all of his media supporters. Columnist Ann Coulter wrote on Twitter that the emergency declaration was nothing more than a cynical political play to Trump’s conservative supporters. Fox News host Laura Ingraham: “The president’s instincts on this have always been right. Truthful, pragmatic thinking." Rep. Ruben Gallego (D-Ariz.), an Iraq war veteran, took to Twitter to criticize Trump’s reported plan to tap about $3.6 billion from a military construction fund to provide part of the funds he needs to build his wall along the southern border. Todd Harrison, a military budget expert at the Center for Strategic and International Studies, told NPR that seizing money allocated to the military to build houses and improve bases could be controversial. After the House voted overwhelmingly to pass a bipartisan spending deal, House Judiciary Chairman Jerrold Nadler (D., N.Y.) told the Washington Post Democrats were likely to introduce a joint resolution disapproving of Trump’s declaration of an emergency. "This is a gross abuse of presidential power," Nadler told the Post. "This is an attempt to overturn the basic constitutional doctrine of separation of powers. Congress has the power of the purse. It cannot be tolerated." It’s unclear when the resolution will be introduced. But it would easily pass in the Democrat-controlled House, and would force Senate Majority Leader Mitch McConnell (R., K.Y.) to put the resolution to a vote, where it could narrowly pass and force Trump to issue the first veto of his administration. » READ MORE: Do walls really work for border security and immigration?